SPOKEN HISTORIES is an innovative public oral history consultancy that enables you to make history by using oral history to preserve memories of the past and conserve the present. 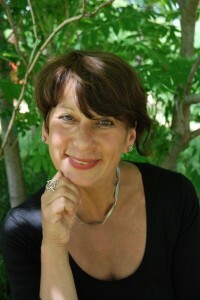 The consultancy is headed by Barbara Gibson who has over 20 years of oral history experience. Barbara uses her skills as an interviewer, honed over many years, to produce life-story oral history recordings as Personal Commissions for the many people who want to create a lasting legacy for their families, or some use this as an opportunity to reflect on their own lives. 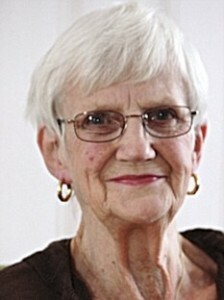 She offers help to people researching their own family history through a dedicated two day Family Oral History course. During the course people will learn how to interview their relatives or someone close to them to extract, record and process the information in ways that will enrich their history by bringing it to life. Oral history adds immeasurably to public history and community history. The ‘Men Remade’ Wartime drawings inside Queen Mary’s Hospital, Roehampton by Paul Drury, 1940-45 exhibition at Wandsworth Museum, London, 2005 was a prime example of how a Spoken Histories’ oral history commission was integral in the production of this successful and fascinating public history featured below. Good oral history depends on sensitivity and a responsible code of ethics which Barbara demonstrates in every project she undertakes. It was these factors which enabled Molly Linn to trust her interviewer with her story. She remembered how just a few days after her twelfth birthday in 1943, she was looking forward to her celebration trip to the theatre and had just had her hair done in the fashionable ‘swoops’. But she never got there.That day her school, in Sandhurst Road, Catford, London, was bombed by a rogue German plane – the pilot was flying so low she even saw his face. She became a casualty, found under a heap of debris. Listen to her recalling the events after hearing the air-raid siren at school. Molly’s legs were so badly crushed she had to have them amputated just below the knees. She ended up in Queen Mary’s Hospital, Roehampton, the national specialist centre for amputee rehabilitation and limb fitting during WW1 and WW2. She was one of just a handful of children in a hospital full of injured servicemen and women. Molly tells her story very candidly, through the eyes of herself as a frightened child. She remembers many aspects of hospital life and how these affected her. Molly’s story was especially important because it was during this time that she met the acclaimed artist Paul Drury, whose drawings were the subject of the exhibition. 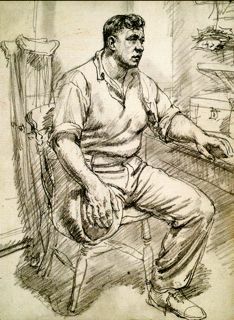 Paul Drury did not want to be a war artist, rather, he sought to relieve the sufferings of people caused by the war. He did his war service by using his skills and craft in the Plaster Room at Queen Mary’s Hospital. It was here he also captured, in his drawings, many aspects of hospital life. He drew sensitive portraits of injured patients and careful studies of the latest limb technology. He also helped devise the ‘Plaster Bed’, a plaster cast of the whole body that reduced pressure points and bed sores. Listen to Molly as she remembers various aspects of her treatment and her memories of Paul Drury. These are two of the five audio clips that contributed to this captivating exhibition about technology, medicine, drawing and local history. Molly’s life-story is archived in Wandsworth Museum and is a wonderful resource of living social history of an ‘ordinary’ person from Lewisham, London, with an ‘extraordinary’ story, documenting her life from the 1930’s, through WW2, to the present day. Her story is also of special value in its contribution to the history of the Queen Mary’s Hospital in Roehampton and to people with special interests in the development of technology, medicine and their local history. In addition, she was able add to the public memory of Paul Drury as a gentle, caring and softly spoken man and how these attributes helped to comfort a frightened child. The exhibition was a collection of Paul Drury’s wartime drawings, the model of the Plaster Bed, period prosthetics and other medical artefacts illustrating the past treatment and rehabilitation of amputee patients. Molly’s audio clips really contributed in bringing the gallery to life and harnessing the empathy of the audience. It was supported by the V and A Museum and Welcome Trust, London. Molly has given her full permission for the publication of this feature here. SPOKEN HISTORIES is currently delivering oral history training for Salisbury Cathedral Archive’s ‘Spire and Spitfires’ Project. SPOKEN HISTORIES is currently undertaking a commission from the British Library for the National Life Stories collection, Food: From Source to Salespoint. SPOKEN HISTORIES has just completed a private commission from a Marine Commando, seriously injured in Afghanistan. SPOKEN HISTORIES has recently delivered oral history training in interviewing, transcription and digital processing to volunteers at Salisbury Cathedral for their Volunteer Voice Project; part of the Magna Carta events. SPOKEN HISTORIES has been commissioned by Wiltshire and Swindon History Centre to undertake the oral histories of Wiltshire’s 30+ WW2 Arctic Convoy Veterans. These veterans have only just had their incredible WW2 efforts officially recognised and they were awarded their Arctic Star Medals at the later part of last year. During WW2, they had to endure not only the harsh conditions of the Arctic Ocean but the constant exposure to enemy fire too. They witnessed many of their ships being destroyed, and many of their colleagues losing their lives, whilst transporting vital cargo to Russia after it had been invaded by Germany. It is a real privilege meeting these veterans and recording their stories. SPOKEN HISTORIES has just overseen the development of the online memory walk in conjunction with volunteers for the Milford Street Bridge Project click here. We won the Community Archives and Heritage Group of the year 2015 award.